I’m pleased to introduce today’s guest poster, Matthew Crow, a regular commenter here at The Junto, who received his PhD at UCLA in 2011 and now teaches at Hobart and William Smith Colleges in New York. 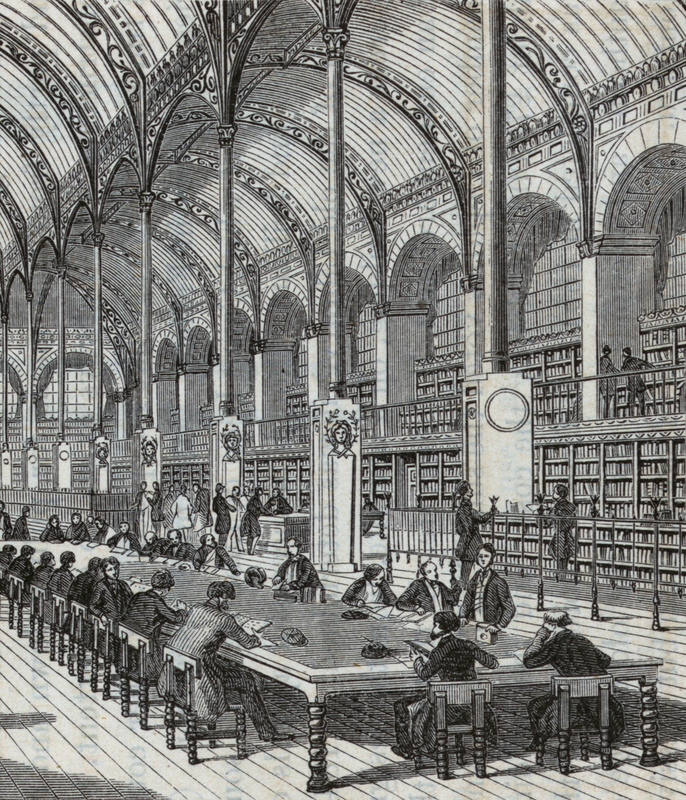 In his compendium of global archival practices, Memoirs of Libraries, Edward Edwards developed a history of how various peoples had organized their relationship to their pasts. For Edwards, political emancipation in the wake of the great revolutions required broadening public availability of the historical documents archived by the state. In one brief but suggestive passage he discussed the public printing of laws as one avenue of this kind of material public history. The ideal here was what Edwards provocatively called “public historiography,” the material conditions necessary for the public’s access to reading, understanding, and participating in the making of law. He identified Thomas Jefferson as a representative figure of the discipline. For Jefferson, the recognition of collecting, organizing, and presenting the past as a political project could only be made good on in a revolutionary republican polity, where history itself was recognized as the textual material at hand not only for remembrance but for reconsideration and potential remaking. I would like to suggest the idea of public historiography is itself something we can remember and use to rethink the nature of historical practice today. It is only possible to understand Jefferson’s obsessive collections and preservation of colonial legal manuscripts as part of a project of historically inflected self-constitution, and this dovetailed into an awareness of the material, textual basis of the public’s relation to its foundational documents. Jefferson’s fragments of the legal history of Virginia are preserved as cultural treasures at the Library of Congress, but they are also ruins that crystalize the various histories present in their collection and transmission. These documents provided archival authority to the colony’s uncertain status within the imperial constitutional culture, and as such were building blocks of civic identity. They played an important role in Jefferson’s imagining of a revolutionary constitutional culture predicated on equipping the citizenry with the capacity to read and reassemble the textual basis of their polity. For Jefferson, a constitution was less a text than an assemblage of texts and writings as well as the practice of collecting and using them. What he looked for was something like a democratization of an aristocratic and virtuosic form of reading and collecting, a form of reading that was in effect a form of life. The Jeffersonian project was centered on a particular image of the ideal citizen, a citizen with cultivated capacities for active inheritance and transformative work on the materials, and so the real political power, that they take into their hands. Walter Benjamin says that every document of civilization is also one of barbarism, and that the history of the transmission of these documents is as vital to any materialist historical project as the documents themselves. It would be difficult to find someone whose history gives better witness to this insight than Jefferson. Not only do the laws of Virginia record, maintain, and secure a patriarchal legal culture predicated on slavery, but the active historical agent of Jefferson’s vision was a fundamental part of his circumscription of the civic capacities of African Americans and Native Americans, both of whom by the lights of the Notes on the State of Virginia lack the cultivated capacity to collect and represent constructive histories to themselves. And as a personal aside, this history is enough to make me skeptical of political and educational reform projects grounded in vocabularies of capacity and development, precisely because these words continue to put their users in the position of measuring and dictating the civic capacities of others. But in this extended moment of danger to the university and the republic, the idea of public historiography returns for redemption. Against both the ossification of monument, heritage, or tradition and the professional ethos of the historian as expert contextualizer, I throw into the mix the idea of historical research and writing as principally the transformative work of civic practice and use. I think this would mean a kind of historical work where the line between study and teaching fades, so much so that the line between the history and the study of that history fades with it. I think this would mean historians taking it as their task to render the founding and the foundational texts that transmit it available for recollection and visible from the standpoint of their potential remaking. And it would mean caring for the possibility of a historical and radical politics, one that begins with our acknowledgment of a plurality of routes for moving back and forth between the past and the present. Edward Edwards, Memoirs of Libraries, Including a Handbook of Library Economy, 2 vols. (1859; reprint, Cambridge: Cambridge University Press, 2010). Walter Benjamin, “Theses on the Philosophy of History,” in Illuminations, ed. Hannah Arendt (New York: Schocken, 1969), 256. I have never understood there to be any kind of line between study and teaching. I’ve always seen the two as complementary parts of the same task facing any historian — to study and then to share the results of that study via the entire spectrum of techniques that we can group under “teaching” — and that includes curating historical exhibitions, editing and writing books, giving lectures (whether to colleagues or to students or to the general public) and on and on and on. And, in my experience, the greatest of my teachers — Henry Steele Commager, Richard B. Morris — and the greatest of the field’s scholars — Bernard Bailyn, Edmund S. Morgan, John Hope Franklin, David Brion Davis, Pauline Maier, et al. — did the same thing. And I’ve tried to do the same thing myself. People today would probably call him a hoarder. I think he’s a preservationist, scholar, politician, teacher, national treasure, and more. Those of us who love history and books are forever in his debt. We have him to thank for the Library of Congress. As an American, I dare anyone to come up with a more eloquent way to declare our Independence. He is “The Enlightenment”. –yes, especially because of the lack of a written language… which is why oral histories and material culture should bear more important weight in intellectual and document based histories… not just in the history of our First Peoples and those from the slave trade –but in the marginalized voice of the poor, disenfranchised and women. The numbers are fuzzy in my remembering –but the literacy rate at the time of Jefferson’s presidency was less than 20% –and among women, only at about 3%. I am certain this colored Jefferson’s image of the ideal citizen and colored the available documents for collection to begin with. And, it certainly affects and effects historiography today –especially in the manner of learning and teaching. What primary resources are available? What primary resources are available in the classroom? Keep pushing at the barriers, keep pulling on the fringe of resources. It’s what keeps historiography and hence, history, interesting.